A recent survey has found that most urban residents believe public health insurance is a worthwhile deal and it eases their concerns about visiting a doctor. More than 69 percent of urban residents on the Chinese mainland support public health insurance, in which the government pays most of their medical costs, according to the survey released by the Guangzhou Public Opinion Research Center on Tuesday. The center interviewed more than 5,000 urban residents by telephone on the Chinese mainland in September. Eighty-six percent of respondents said government medical insurance has a high price-performance ratio and is a good deal. Only 6 percent think public medical insurance is not worth the money. Currently, urban residents are required to pay about 5 percent of their monthly income to join the government's medical insurance plan, in which the government pays more than 50 percent of their medical costs. The government pays a higher percentage for inpatient treatment. But there is public concern over the difficulty and high cost of getting medical treatment on the mainland. More than 67 percent of respondents said medical costs are high, 24 percent found them moderate and 5 percent said they are cheap. About 50 percent of patients preferred to buy medicines in local drugstores if they were not seriously ill, rather than visit doctors in hospitals because of the high medical costs, complicated procedures and long waiting times. Zheng Fenming, director of the institute of modernization strategy at the Guangdong Academy of Social Sciences, said the difficulty and high costs of visiting doctors remain major problems in China even though governments at all levels have introduced measures to try to alleviate the situation. "The previous medical reforms and measures to reduce medical care charges have had little effect," he said on Wednesday. Zheng urged government departments to further increase medical resources by lowering the threshold to allow more foreign and private funds to establish hospitals. "State-owned hospitals have basically monopolized the country's medical industry," he said. Urban residents should buy commercial medical insurance if they want to enjoy high-quality medical treatment after the government has provided basic medical insurance, he said. 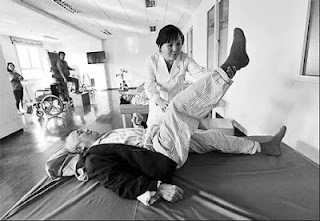 "Compared with some developed economies and regions, China's input into medical coverage is still not enough," he added. Dong Changsheng, a Guangzhou office worker, said government departments should further boost investment in public medical insurance so that more people can benefit from the plan in the coming years. "I feel comfortable only when I have government medical insurance coverage," he said.